This Ongoing War: A Blog: 03-Nov-15: What do they mean when the Palestinian Arabs say they oppose terror? Over at Mosaic Magazine, they published a long analytic piece yesterday by Dr Daniel Polisar entitled "What Do Palestinians Want?" 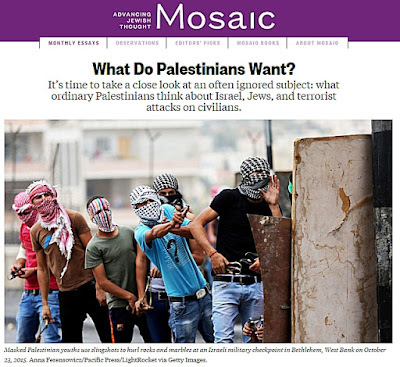 Our sense is that the sub-title, though long, conveys the substance of the article more clearly: "It’s time to take a close look at an often ignored subject: what ordinary Palestinians think about Israel, Jews, and terrorist attacks on civilians". in which young people choose whether to wake up in the morning, pull a knife from the family kitchen, and go out in search of martyrdom. examined over 330 surveys carried out by the four major Palestinian research institutes, each of which has been conducting regular polls for a decade or more: the PSR headed by Shikaki and its predecessor, CPRS; the Jerusalem Media and Communications Center (JMCC); the Birzeit Center for Development Studies (CDS), whose work was later continued under the same director by the Arab World for Research & Development(AWRAD); and the Opinion Polls and Survey Research Unit of An-Najah National University. Each of the four has conducted between 50 and 120 polls... all are independent of any government, party, or other institutional framework that might introduce systematic bias into their work... Moreover, many of their questions are asked repeatedly over time, making it possible to adjust for momentary swings of opinion. And since the questions asked by the four institutes are themselves often similar, it is possible to compare responses, thus testing the degree to which the findings are or are not affected by the specific perspective or methodology of a given institute. Makes sense. The result is a fascinating, well-written insight into attitudes that shape Palestinian Arab society but Israel's too. Based on our experiences with most of the reporters we have met in the past decade, their work of covering events here in Israel or the emergence of global jihad and terrorism in various forms would benefit mightily by spending a few minutes delving into Polisar's analysis. We will comment here on just two specific aspects. Poll numbers sometimes indicate that a majority of Palestinian Arabs oppose armed attacks on Israelis. The details and the ups and downs are not the issue. He points out how this works inside a society in which a very sizable minority (at least) favors extreme violence, and in particular how "it does not much matter if they are slightly outnumbered by those opposed to such actions. Anyone contemplating an attack can still expect to benefit from a substantial network of backers, and if successful to bring great honor upon himself and his family." Our observations, from our very specific vantage point, lead us to fully agree. The role of honor (and shame, for that matter) is huge, and and hugely under-estimated, in the lives of Pal Arabs in ways that significantly impact on what happens. It's also often the case that polls of Palestinian Arabs show they reject terrorism on moral (or other similar sounding) grounds. Polisar introduces a qualification that is actually much more than just that. Referring to one particular result (it doesn't matter which for this purpose) he points to the critical matter of how Palestinian Arabs interpret the word “terrorism”. He brings hard data (Palestinian Arab data, please note) to show what they consider to be not terror: (a) The 2001 assault on the Dolphinarium discotheque on the Tel Aviv seashore was not terror (only 15% said this was terror); (b) the murder by Palestinian Arabs in a Jerusalem hotel of an Israeli government minister, Rehavam Ze’evi was not terror (only 10% thought it was terror); (c) the use of chemical and other weapons of mass destruction - hypothetically speaking - by Palestinians against Israelis is not terror (a mere 25% said that could be called terror); (d) the New York and Washington DC attacks of 9/11 were not terror (a minority - just 41% - thought they were terror); (e) the massive attacks on civilians in Madrid's trains in 2004 and on London's bus and underground transport systems in 2005 were not terror. Yes, minorities of Palestinian Arabs viewed those as terror, but for the record, the rest of the Arab world overwhelmingly took the opposite view and called terror terror. Observing these odd, and it has to be said, deeply disturbing results, Polisar calls this Palestinian Arab phenomenon a "highly differentiated usage of “terrorism” [that] affects the wording of all surveys conducted among Palestinians". There's a harsh reality here that is bound to generate some resistance, or perhaps disbelief. The data show that Palestinian Arabs have a specific way of looking at terror that simply does not fit with the views of most of the rest of the world, and not even with the other parts of the Arab world. Have any other serious observers focused on this? If they have, we seem to have missed it. And should this not be a factor that plays a role when peace initiatives are discussed? Or when confidence-building measures (normally suggested to only one of the two sides - no prizes for guessing which) are discussed in the media? Polls are fine and useful and so on but there's another way of gauging public opinion that most of the world uses regularly. 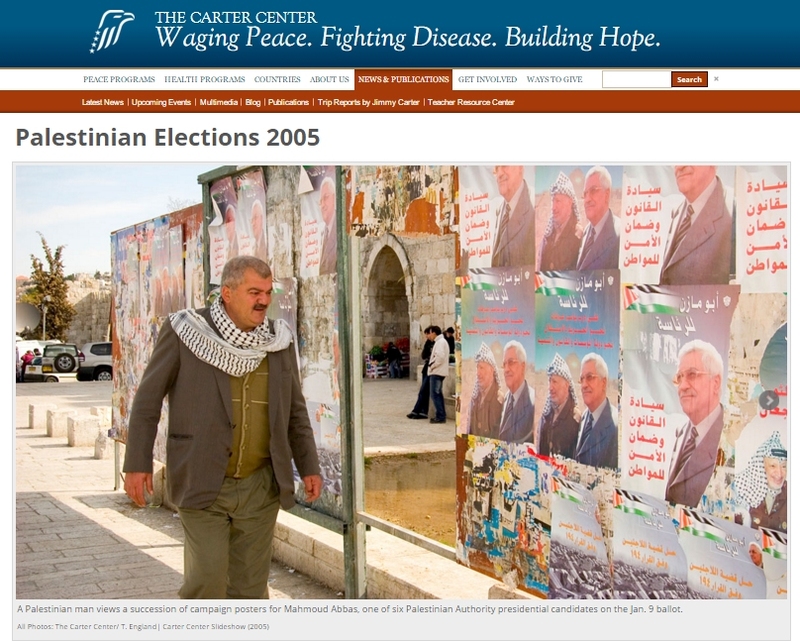 When were the last elections in either of the two Palestinian Arab entities? Why are elections such a low priority for people ruled by autocratic regimes, living with significantly un-free media, and ostensibly desperate to have their voices heard? It would have been nice if the writer of this article looked closer to the root cause of the issue. Through out history, when injustice existed and discrimination forced on people, violence by individual and groups is the invitable reaction. This article resembles the act of victimizing the murderer (the invader) and incriminate the victim. I'm not going to go back in history to explain how the jews stole the land of Palestine and murdered hundreds of thousands of Palestinian families. Let's just look at the last 15 years . Palestinian were begging for peace and equality. The response by the Israelis was more killing, arrests and illegal settlements. Also the writer miserably failed to address the issue on how the Israelis fight peace with all its power, becuase peace to them means the limitation of their crazy expansion plan from the Furat river in Iraq to the nile river in egypt (the meanning of the Israeli flag). Israeli is fighting its own people who are peace activists and calling them a self hating jews. Please check out Jewish Voice for Peace and take a look at thier facebook pagehttps://jewishvoiceforpeace.org/. I hope the writer take a closer look at the facts before blindly defending the actions of Israel and the root cause of the results of these surveys. Injustice is the root cause of all wars. If your being forced out of your home and your family burnt alive while sleeping, you got nothing to lose. A random emotional reaction like stabing a supporter of the murderer is an expected result . It would have been nice if the writer of this anonymous comment had identified himself or herself, as we request of all commenters. (Don't bother commenting on our comment unless you identify yourself.) It would have been nicer if he or she had read what we wrote, and had addressed our points and/or the substance of the Polisar article.